So last week was my friend's birthday. And I always make her something for her birthday - she is a wonderfully eager recipient of handknits and it's fun to make things for such an enthusiastic audience. Except I totally spazzed on the date and didn't have a whole lot of time. Calorimetry to the rescue! The yarn is Sheep 3 by Sheep Shop Yarn color number F60. Her favorite colors (it looks much closer in the yarn web site photo) and a quick knit. I gave it to her without the buttons - I can only knit but so fast and it was either finish the knitting or shop for buttons. I had read a lot online about how the pattern came up to big, but I didn't read all of that until after I had knit the whole darn thing. Thankfully she has some serious hair so it wasn't too big at all. Next is a bitty hat I knit for the Kid out of some stash yarn,Big Ball It took about a minute and a half to whip up and goes quite nicely with her new winter coats - one of which is purple and one of which is pink. Other than that it has been all step dancing all the time. The Mid-Atlantic Oireachtas is this weekend - the regional dance championships for step dancers. The Kid has a team event on Saturday and a solo event on Sunday, and the preparations have been endless, not to mention expensive. I shudder to think about the amount of yarn money that has gone into this caper! But so it goes, she loves to do this and I want to reward her effort. Oh, and there was a side trip to the Manchester Library last week for a book signing = what a great group I had! Waving to all of you who were there! Many many knitters, a great, interactive group to play with while I was talking, and lovely projects to look at. I will be in Point Pleasant in February - come there too!!! Okay - off for the weekend. Happy Thanksgiving to all of you who partake of turkey day, and to those of you about to compete - I salute you. I need to go pack the vodka and spicy apple martini mix along with the costumes, wigs and shoes! This sweet little dog toy was knitted by a Knit-a-Bit regular and was hanging out with us at the book signing on Monday night (the toy, not the knitter). And yes, Nichole, I meant NJ and not NH - no sudden moves on my part! Anyway, Susan from Knit-a-Bit had to leave early and left the keys with one of the Knit Knight regulars so she could lock up when we left. 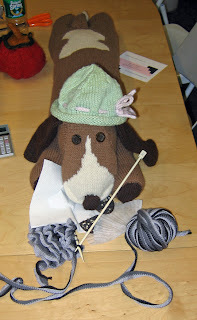 As soon as there was no adult supervision, Miss Puppy here went crazy - she put on a sample hat, snatched up the remaining cookies, and took up knitting on Susan's sample where she left off. Which I don't think will bother Susan - she would probably be happy to have the sample finished! Testing, testing, can anybody hear me? Post with photos to come soon - I just wanted to try this out and see if it works. Oh, and Laurie Perry has a link up to her portion of the interview too - check it out at her blog. a Big Ball that has been lingering in the stash for a while and whipped up a little beanie cap for her. Then I accidentally bought a skein of that wide flat braid that you knit into to make ruffled scarves - can't find the ball band and can't remember what the hell it is called, but I promise I will take pix later - and knit up a little scarf for her out of that. And I spun and I spun and I spun - I love having more than 4 ounces of a single colorway of roving at one time. 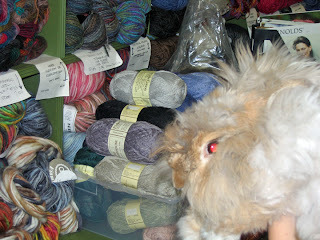 Tonight I am at Knit-a-Bit in Westfield, NJ - drop by after 7 if you are in the neighborhood. 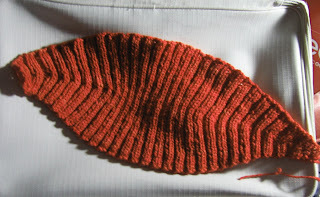 I am going to try to finish the Lacy Ripple Socks that I am doing in STR, because it is almost cold enough to wear them. And I very much want to wear them - so soft and squishy! No pix today - Blogger is being hateful and life is too short for me to bang my head against this particular brick wall. I'll just rattle on instead. Tuesday night/Wednesday morning I was asked to be on a talk radio show that airs in Montreal and Toronto. I thought this was a swell idea until I heard that I was on the air at 1AM my time. Oy. Buy PR ho that I am (Hey - did I mention I wrote a book? Did I? Huh?) I agreed, and sat here and watched videos until it was time to sit by the phone. Yes I could have taken a nap, but I worried that I would either sleep through my alarm (having sucked up some cold medicine because of course I was sick and was losing my voice), or sound so bleary on the phone people would stage an intervention, so I waited up. Anyway I am listening to the promo stuff before I get to talk and I hear that right after me is going to be Laurie Perry, Crazy Aunt Purl herself. And I can't talk to her because we are on separate phone lines at different times (and on different coasts - SHE didn't have to talk at 1 AM, bless her heart) and it was very frustrating for me, because I am a total blog stalker of hers and I wanted to see if she said "drunkenology" again. But I said nice things about her, and apparently she said nice things about me too, but I don't really know because me and the cold medicine fell asleep right after I hung up the phone. But I almost met her, really, I almost did.